The Brewers are heading to the NLCS. Milwaukee completed a three-game sweep of the Rockies with a 6-0 win at Coors Field on Sunday. It will now face the winner of the Dodgers-Braves NLDS matchup with a spot in the World Series on the line. The Brewers took an early lead on an RBI groundout by Travis Shaw in the first. They then pulled away when Colorado reliever Scott Oberg balked in a run and allowed a runner to score on a wild pitch in the sixth. Jesus Aguilar, Orlando Arcia and Keon Broxton all also added solo home runs for the Brewers. Milwaukee outscored Colorado 13-2 over the three games. The Rockies failed to take advantage of some early scoring chances. Colorado had an opportunity to at least tie the score 1-1 when Trevor Story led off the second with a single and moved into scoring position on a walk by Carlos González two batters later. Ian Desmond, however, followed with a line out and Tony Wolters grounded out, ending the threat. DJ LeMahieu registered a two-out double one inning later to set up an RBI chance for Rockies star Nolan Arenado. But he was stranded on second when Arenado hit a grounder to shortstop. Brewers starter Wade Miley shut down the Rockies but was removed after just 4 2/3 innings, leaving his bullpen to record 13 outs. Milwaukee’s relievers were up to the challenge. Five Brewers pitchers held the Rockies scoreless in 4 1/3 innings of work. They allowed one hit, struck out six and walked just two. The Brewers relied on their bullpen heavily throughout the series and their relievers were a big reason for the sweep. They even went with a bullpen day in their Game 1 win. The Brewers haven’t lost since Sept. 22. 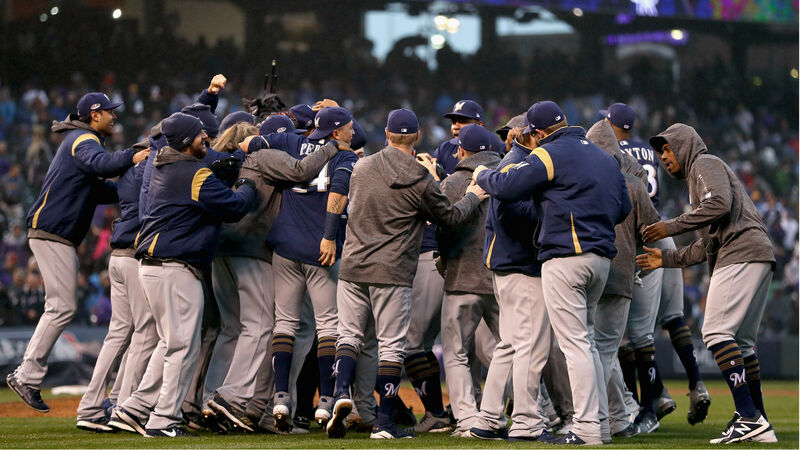 Milwaukee ended the regular-season by winning 10 of its last 11 games, including a Game 163 victory over the Cubs to earn the National League Central title. It then opened the postseason by topping Colorado in three consecutive games. That’s 11 straight wins for the Brewers, Including the playoffs. They’ll head into the NLCS with a ton of momentum.